I care, you care and we care, too! I’ve heard enough and must come to the sad conclusion that our skills in Standard English has gone from bad to worse. The rampant and accepted use of code-mixing by public figures, not just in a casual setting but even in formal events, has set a bad example for everyone to follow. 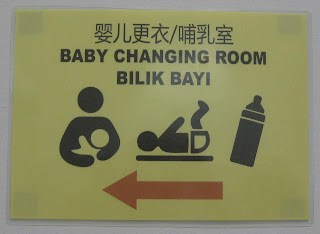 Pause for a moment and ask yourself: How often have you mixed both English and Bahasa Melayu in one sentence? 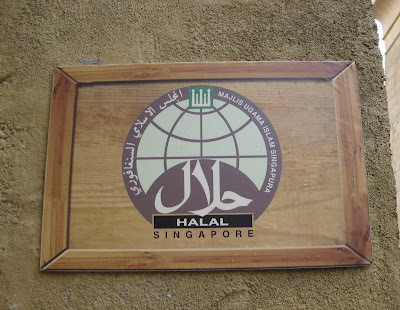 “Come let’s makan!” and everyone knows it is an invitation to eat. It may be the norm for a friendly, casual exchange among friends in our multi-racial community but it is increasingly common for MC’s and presenters to code-mix too. They are however often forced to do so when there is no translator but this is becoming a bad habit for everyone to lapse into code-mixed language even in a formal speaking session or interview and I see them struggle to find the accurate English word when they have to put it in writing! Last year my niece told me that she and a few friends were hanging out on a school corridor when another group of girls wanted to pass that way in a great hurry. To get their attention to give way quickly, one of the girls rushing pass shouted, “Let me pass away!” “Let me pass away!” If this is anything to go by, it appears that Form 5 students in one of Johor Baru’s “better” schools have yet to master the basics of Standard English. A few weeks ago, my niece said she had a similar, “Let me pass away,” experience but in the college she now attends in Kuala Lumpur. It is sad and shocking that the deteriorating standard in English is permeating all levels of education and if it is not arrested in the classroom, students are going on to college, university and abroad with weak English. What is more disturbing is students who want to pursue degrees in overseas universities are oblivious to the fact that they must submit their thesis and dissertations in English and they are not able to master the language early. Recently, over lunch with Datin Maimunah Abdul Rahman, Executive Director of M Suites Hotel, this subject came up and we traded horror stories about the deplorable standards of English today. I am familiar with M Suites Hotel’s community programmes for the educational development of single mothers under their Corporate Social Development programme that started in 2002 and they recently shifted their focus to students’ education development. Among other events, I attended their Students Smart Study programme, a Primary School Choral Speaking competition as well as Secondary School Debates in Bahasa Melayu and English that were sponsored by the hotel. I share Datin Maimunah’s passion for the English language and while I did not pursue a doctorate in education and literacy like her, I did Teaching English as a Second Language (TESL) with emphasis on English for Specific Purposes (ESP) when it was first offered in Universiti Teknologi Malaysia (UTM). This study has nothing to do with my work but I just did it for fun. I was among three or four other non-teachers in the class and while a few dropped out in the second semester, I persevered and it took me by complete surprise when I ended up receiving the Best Student Award! 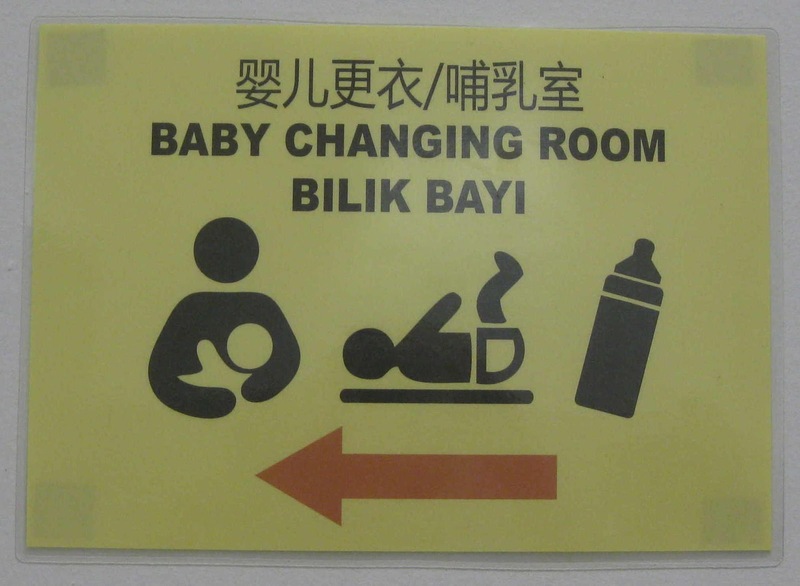 Here's where you can swap your baby - for another? Incidentally, one of our lecturers in the TESL (ESP) course was Associate Professor Khairi Izuan Abdullah and he will be among the seven plenary speakers in the Johor State English Language Conference organized by the Johor Baru English Language Teaching (JELTA) and Johor State Education Department in cooperation with M Suites Hotel as the main sponsor from 12 to 14 June 2012. This conference in the theme, “Revitalising the teaching-link” is open to English language teachers, tuition teachers, trainee teachers, lecturers and other English language practitioners, especially those from rural areas, to gain insights into innovative ideas that can be incorporated into the challenging task of teaching English. A forum will be held on the final day with the findings collated and submitted to the Johor State Education Department for their reference, review and implementation. To borrow an illustration from gardening, gardeners know it is difficult to plant successfully in dry ground but it must be prepared, watered and fertilized to encourage better plant growth. In the same way, teachers must be trained and equipped to make lessons more meaningful and memorable for students to get the best out of their teaching. Students studying with English language teachers who are motivated, creative and passionate about what they are doing will enthuse them to excel in the subject. I hope English language practitioners in Johor will take advantage of this conference to hone their skills in making their language classes more fun and interesting. Teachers and mentors are further encouraged to apply what they learnt from this conference to motivate students to do their best because 10 students who score “Super A” distinction in English in the next SPM exam, will be identified by the Johor Education Department to receive a special cash award sponsored by M Suites Hotel. English teachers who are passionate about the language must stop the blame-game and focus on enhancing their own skills so that they can help students who are keen to improve their English. Just look around and you can easily spot atrocious and often, careless and embarrassing English on signs, labels, posters and banners. It is proof of how our English has deteriorated from bad to worse so let us start to put a stop to it now. Just read your article about the state of our English Language! 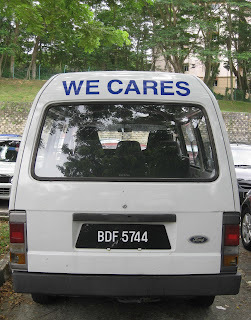 And the photo of the van with "We CARES" is a glaring reminder of how bad English is among us. Yes, I do remember En Khiri, that gentle guy who taught us English... I enjoyed every minute of his lesson. He is a gifted teacher and a humble, simple guy at that. We need to get the kids to READ, READ and READ. Many do not read any story books or novels... they are too busy playing computer games or sending text messages in short forms to their friends. That alone deteriorates their English further. People don't want to read books or newspapers anymore and that's sad. I have not heard of The Runaways but Allan insists that they are local people and invited me to drop by on either of the two days when they perform. 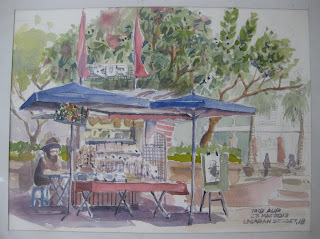 This was months ago and with my busy work and travel schedule, I just did not find time to pop in. Then last night, I was at an event in the neighbourhood that ended early so I decided to swing around to check the band out. I was pleased to find a parking space on a busy Friday night and gladder still to see a respectable crowd in the indoor and outdoor dining areas. As my eyes adjusted to the dim lights in the garden, I realized that the tables set out under the sky were also occupied. But I did not hear any music. 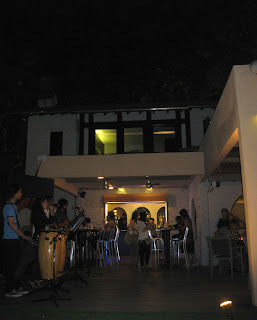 When I stepped out to the patio, I spotted musical instruments arranged, ready for the show and the band was just finding their places to start their first set for the evening. “What perfect timing!” I figuratively patted myself on my back as I approached the band. One of the band members looked awfully familiar and as we exchanged impolite stares, I suddenly recognized him! As The Runaways struck up the band, I noticed that their brand of music was slightly different from that of Bonjoza Acoustic but it was all good. Besides Romal Mohd Melvin on lead vocals and percussion instruments, I recognized drummer, Dzulfiquar Md Nor, also known as Joy, playing his djembe and bongos. 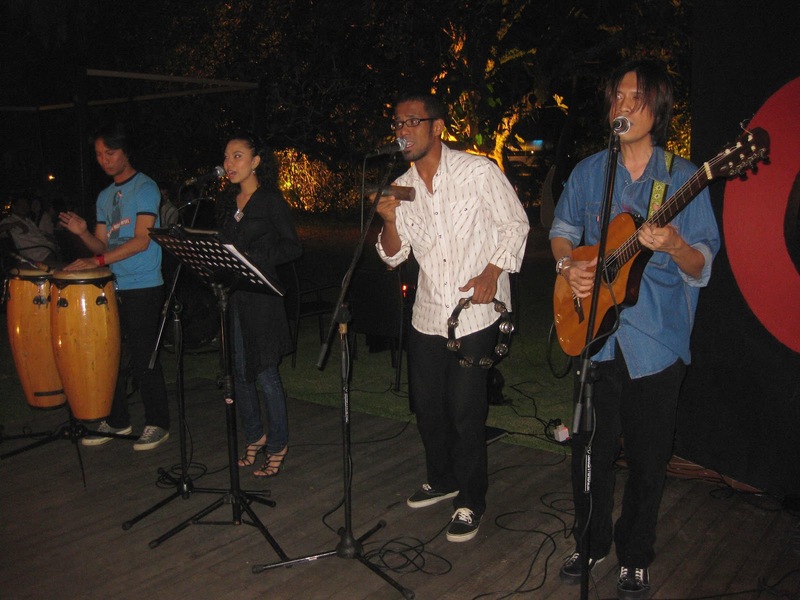 Two new members are Hyder who plays a mean acoustic guitar and Amira, better known as Amy who provides an added dimension with her smooth female vocals. Sometime in between songs, something must have clicked in Romal’s memory because he welcomed me by name and thanked me for my presence. Later I asked him why, the Runaways? He explained that each member of this band also performs with other groups and the name describes how they are taking time out to do something they are also passionate about. So for just two nights a week, they are The Runaways at EightLido! 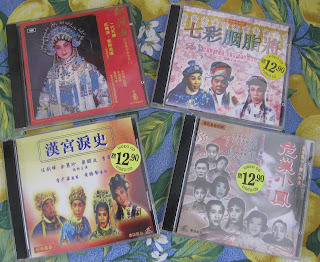 Wherever I travel, I like to buy souvenirs home as mementoes of the places I visited. I prefer useful souvenirs rather than keepsakes for display because it is only a matter of time before space in the showcase runs out. Items that are small and lightweight are best and even if they are fragile, they can be rolled into a T-shirt and carried safely home. From my own trips and through gifts, I have garnered a large collection of key-chains, fridge magnets, ethnic carrier bags and a wardrobe of T-shirts from almost every country I visited. I make it a point to avoid the souvenir shop in the airport, which is mostly for last-minute shoppers, and prefer to shop in markets and shops in the city. 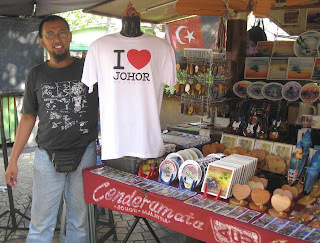 Last week when I went in search of Johor souvenirs to prepare as gifts to relatives who were visiting from abroad, I could hardly find any good souvenir shops in Johor Baru! 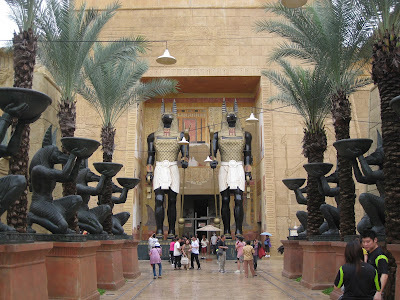 It was sheer disappointment after disappointment when what I came across were only tacky souvenirs and poor quality items that I would not even buy for myself. I just wondered where all the Johor souvenirs have gone and cracked my head to find something suitable with the Johor identity. Then I remembered seeing some watercolour paintings of Johor iconic buildings on postcards at a school fund-raising event recently and went to track down the artist, Taib Aur, who has a business at Lengran Segget. Taib Abdul Razak who calls himself Taib AUR, the abbreviation for Art Untuk Rakyat or Art for Everyone, runs Aur Creative Station with his partner, Zamri Zakaria. Taib, who hails from Taiping, came to Johor Baru in 1997 for further studies and after his graduation he worked for 6 years as a Research & Development Designer. 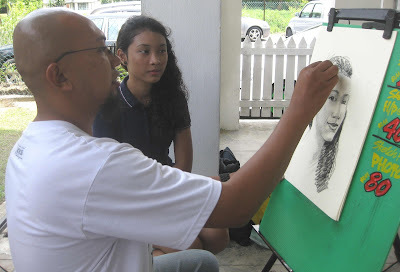 Even with a full-time job, he dabbled in art and from humble beginnings with a small business in Plaza Seni he went on to establish himself as an artist-entrepreneur in Johor Baru. As I browsed around his stall, I chatted with Taib and found it interesting that while he is not a Johorean by origin, he is now creating and selling Johor identity souvenirs. I asked why and he said that he is aware of the opportunities here and is working towards capturing the market with his creative and exclusive merchandise. 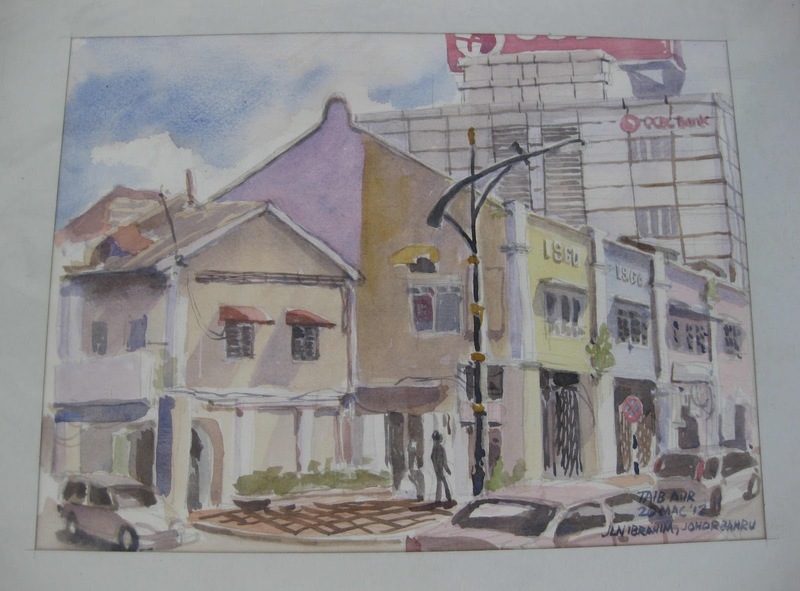 He has identified some of the city’s iconic sites like the Sultan Abu Bakar Mosque, Sultan Ibrahim Building and Dataran Johor, and rendered them in interesting watercolour paintings that are also reproduced in picture postcards. 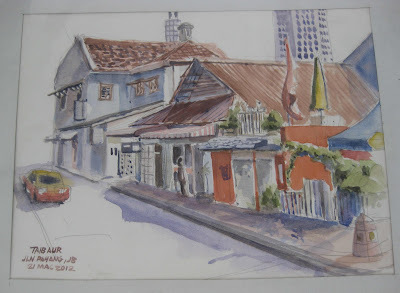 I flipped through his collection of watercolours and recognized several paintings of streets in the heart of old Johor Baru that look both nostalgic and charming. I thought his paintings of Jalan Ibrahim and Jalan Pahang will look perfect in shops and businesses that are after a retro feel. 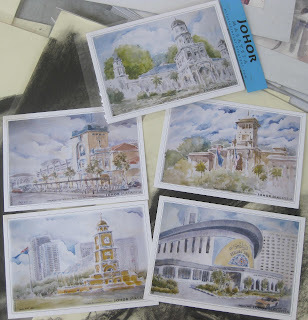 And as Johor is rapidly developing into a modern metropolis, I believe both Johoreans and foreign guests can appreciate glimpses of vintage Johor Bahru from such pretty paintings as part of the décor in modern hotels and offices. Taib, who had several solo art exhibitions in Kuala Lumpur and prestigious galleries in the country, have sold his work to local and foreign collectors. 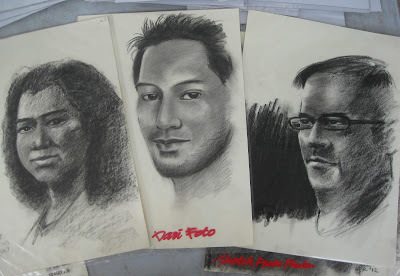 I recalled watching him complete a portrait sketch of a young lady on A3-size paper in just 15 minutes at the school event where we met, and learnt that he accepts commissioned work and also sketches portraits in charcoal from photos. I was glad to finally find several useful souvenirs designed with the Johor identity by Taib for my visiting relatives. On that fine day, business was brisk at but if it rained, he literally has to close shop and take a break because it is virtually impossible to display his merchandise openly in a tropical storm. This is certainly not good for business and I wondered if there was any plan for the city to have a one-stop centre for visitors to Johor Baru to buy Johor souvenirs and local products. An equivalent to Kuala Lumpur’s Central Market is what Johor Baru needs now because artists like Taib and merchants dealing in handicrafts and local products can provide a real service to visitors to our city. The city can also create a Heritage Gallery like the one in Dataran Pahlawan in Malacca city where an entire section of the mall is dedicated to the sale of local products and souvenirs. Best of all, it has parking facilities, is sheltered and visitors can shop in air-conditioned comfort. There was an attempt to start with Pekan Rabu along Jalan Skudai but its location in the suburbs does not welcome daily walk-in customers and businesses cannot depend solely on tourist visits. 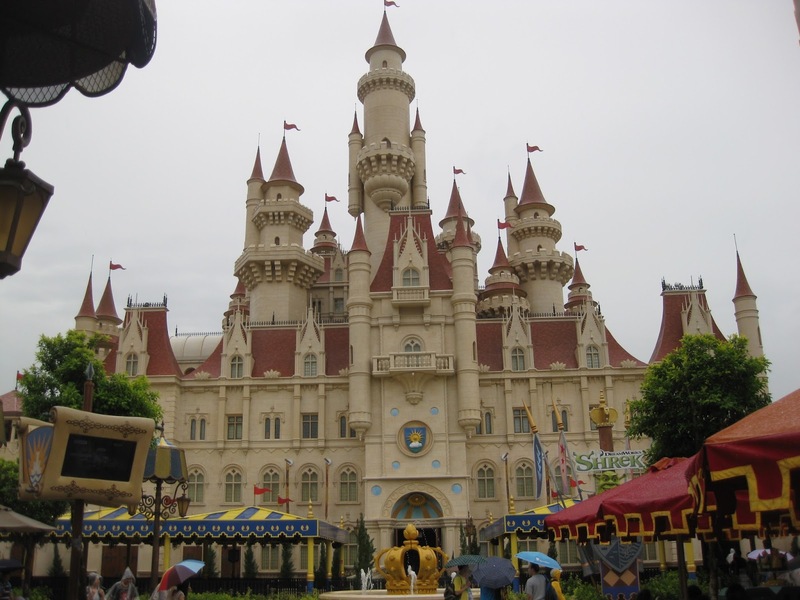 As Johor Baru is poised to attract more visitors to new tourism products like Lego Land Malaysia, Puteri Harbour Family Entertainment Centre, Austin Heights Water Theme Park and tourist-based heritage, arts and cultural events, something must be done soon for visitors to conveniently buy home some truly Johor souvenirs as special mementoes of the culture and heritage in our beautiful state. Last November cousin Malcolm made a trip from Sydney to meet with cousins in Johor Baru to brainstorm for ideas on how we should celebrate grandma’s 100th birthday. 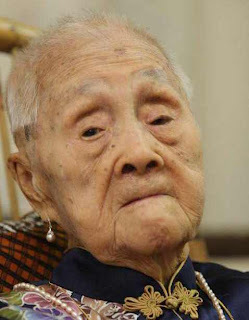 We agreed that celebrating such a milestone as a 100-year old birthday should be done tastefully to honour the life of such a grand old lady. This group of cousins including Dennis, Kenny, Ruby and I, met over lunch and came away with assigned tasks and a timeline to get things done for the planned event in May 2012. 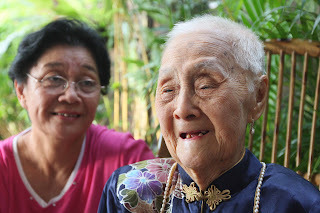 We already have some experience in organizing birthday celebrations for grandma: Her 88th and 90th birthdays were held on a grand scale, with all the bells and whistles, in a Johor Baru hotel. If you have ever planned a grand birthday in the Chinese tradition, you will know that among the many items on the to-do list is to decide on a suitable souvenir to present to guests. For the Chinese, it is an auspicious tradition for guests to receive a souvenir to take home as a memento of such a special celebration. Guests at grandma’s 90th birthday party took home a crockery set of a Chinese porcelain bowl with a matching Chinese spoon and a pair of mock ivory chopsticks. This is quite a common idea for Chinese grand birthday celebrations as it augurs well for guests to be blessed by this auspicious wish to continually have a full stomach – the Chinese place a huge emphasis on the joys of eating – symbolized by the bowl, spoon and chopsticks. So for grandma’s 100th birthday, we cracked our heads to come up with a creative idea on what souvenir to present to guests. This souvenir was not a “priority item” on our to-do list because there were other more essential items to deal with first. As the months passed, the cousins stayed connected electronically to follow-up on the assigned tasks and as flights were booked to return for this event and RSVPs were received, things started to gain momentum. Satay fans tied with red ribbons! Ideas were exchanged, discussed and thrown out while some ideas were mulled over carefully because this souvenir should have a significance and relevance to our dear grandma. 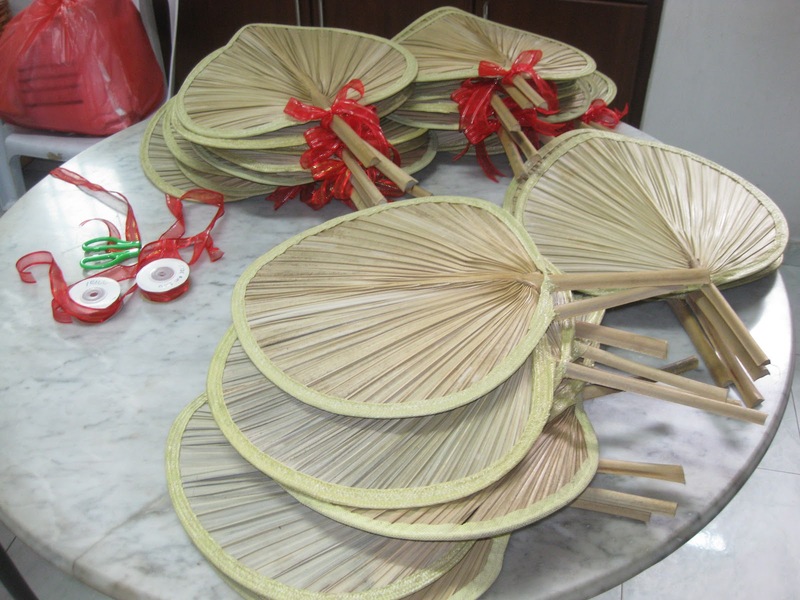 Cousin Felicia gave the idea of a hand-fan while my sister Ruby and I decided that it should be the satay fan, a sturdy type of hand-fan made from a single palm leaf, that we saw grandma using during our childhood, living with them in No.154 Jalan Ngee Heng. In those days there were no ceiling fans or air-conditioning, yet the house was well ventilated with open windows but I remember everyone had their own favourite hand-fan to fan ourselves to sleep on particularly humid nights. Our grandma, however, has a habit of fanning herself with a hand-fan in whatever weather, especially when she sits down after her many chores in the house. 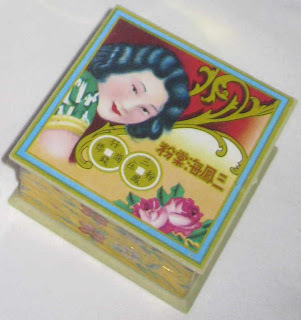 Just as the hand-fan reminds us of our grandma, I thought of another item that is also synonymous with her – the Sam Fong brand cake of traditional Hoi Tong pressed powder that grandma used after her bath in her daily make-up routine. This face powder was probably the only cosmetic that grandma used throughout her life and it kept her skin looking smooth and flawless. And as cousin Shaun recalls, grandma was always well groomed with hair kept in place with a hair-net and I remember, for special occasions like attending weddings, she would wear this face powder and apply a bright shade of Red lipstick, very much like how the lady designed on the powder box did! Reminiscing on their experiences with grandma, cousins Bernice and Ryan agreed that our souvenir should include some of grandma’s special recipes that they fondly enjoyed. I agree that this is a very good idea because it is a legacy that is being handed down to family members and can be shared with our guests. In fact, these recipes are something truly tangible from grandma that everyone can try out, savour and remember her by! 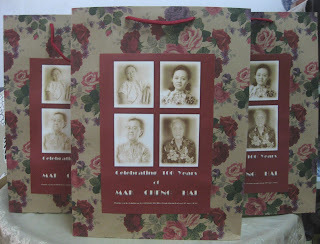 portraits of grandma at different stages of her long life! One of grandma’s specialties is Teochew style braised duck or Lor Ark, which she usually cooked for the family’s Chinese New Year reunion dinner. As a Cantonese married into a Teochew family, she brought her special touch into creating a recipe that is unique and thoroughly enjoyed by everyone. It is one of the staples at the reunion dinner and not just one bird but at least three or four were cooked to satisfy the large family including sons-in-law who joined the Ng family for this special traditional dinner. 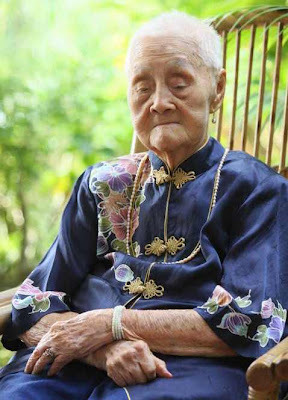 Grandma is also fond of serving thong soi or Cantonese soothing desserts, and one of her seasonal specialties is made with water chestnuts – mah thai (Cantonese) thong sui. To create this delicious dessert, fresh water chestnuts should be shredded against a traditional metal scraper and this required skill and your full attention lest you get your fingers shredded along with the chestnuts! I know this from experience because a split-second of losing focus shocked me with the sight of a trail of red joining the pale shreds of chestnuts and I realized too late, that the red was from my bleeding finger tips! Another recipe that has been skillfully mastered by Auntie Sylvia and Uncle Victor – and more recently, cousin Ryan – is grandma’s steamed egg pudding, thunn taan, literally steamed egg (Cantonese). It is not just the recipe but also the art of whisking the mixture and ability to time the steaming to create the smoothest and creamiest egg pudding ever! When we were kids, I remember watching the adults add a dash of brandy into their steaming bowl of egg pudding before digging in, while we, the kids could only smell it and imagine its taste on the warm silky smooth pudding. So these three recipes, rolled into a scroll, the square of Sam Fong Hoi Tong powder and the satay fan were put into a paper bag and presented to our guests as souvenirs. 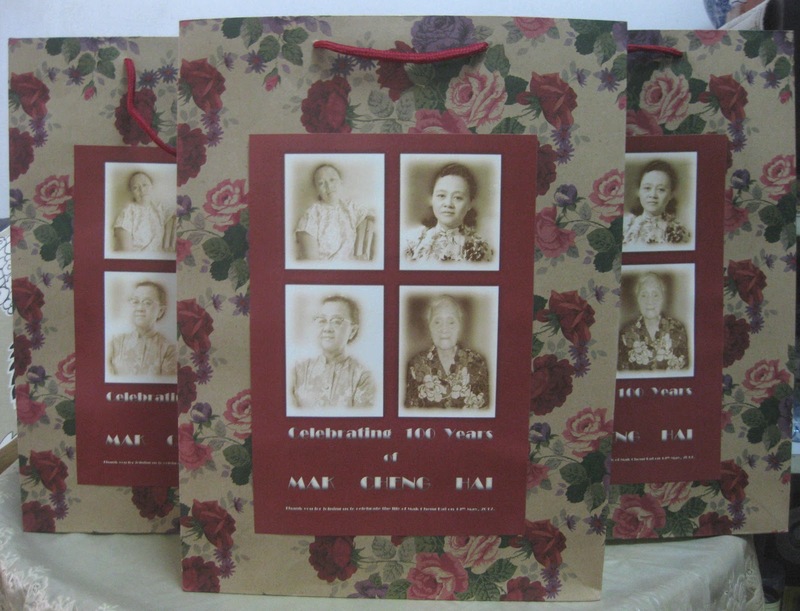 To personalize the carrier bag for the occasion, I compiled a collage of four of grandma’s portraits at four different stages of her life: as a young wife, a mother, then a grandmother and finally, a grand old lady of 99, to be pasted on the bag. The design was shared online for discussion and decisions and cousin Eva did a marvelous job in modifying it into the desired vintage look! 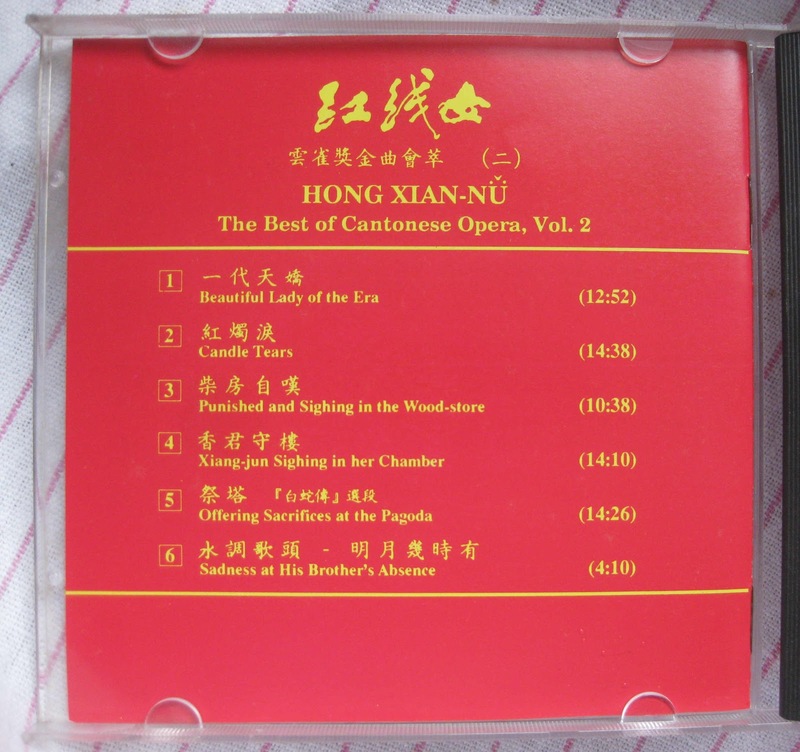 Check out the titles of the operas by Hong Sin Noi! 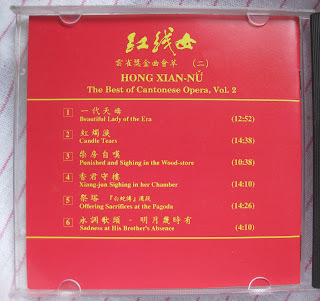 Then I found a Cantonese opera music CD that belongs to grandma, by Hong Sin Noi (Cantonese pronunciation), one of her favourite opera singers and keeping to the vintage theme, played it as background music in the banquet room while guests arrived. To welcome our grandma, the Queen of the Day, on her arrival, we picked the traditional Cantonese birthday song that has a happy refrain of, Kong Hei Nei! Everyone in the room were there to honour our grandma and it was both moving and emotional to share a casual but intimate afternoon together, reliving memories of grandma’s long and eventful life with friends and family who love and appreciate her. Going by the positive comments from our guests, they were privileged to be part of our celebration and this sentiment is reciprocated with our token of appreciation in a gift of ang pau from the birthday “girl” along with our souvenir bag of mementoes. 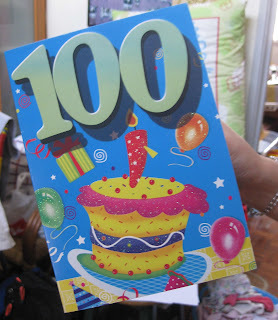 Someone said that after celebrating grandma’s 100th birthday, every day from this day forward should be a celebration and I completely agree with him! She sits quietly in her cane chair, one hand gently waving a hand fan. I watch the serene smile on her face, her rheumy eyes sometime shut as she drifts off into a world of her own. After 100 eventful years, my grandma has plenty to ponder. On 18 May 2012 we celebrated her 100th birthday with a family gathering and a luncheon the next day for friends and relatives who travelled locally and from abroad to join the party in Kuala Lumpur. Born in 1912 on the 28th day of the fourth moon in the lunar calendar, Mak Cheng Hai is the eldest daughter with three brothers, three sisters and three pairs of twins. 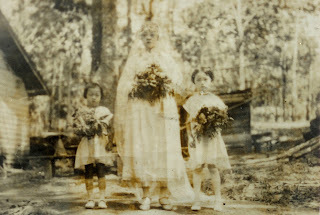 After Ah Kong or grandfather passed away in 1980, I invited grandma to live with us because I knew she disliked living alone. Grandma was with our family for almost 20 years and we saw her age from a robust, strong-willed matriarch to a grand old lady who grew more and more dependent. Over the years she shared with me, snippets of family history, insights into life and her horror experiences of World War Two. These precious memories are treasured as are her priceless sacrifices of putting love into action in her multiple roles as sister, aunt, wife, mother, and now grandmother of 30 and great-grandmother to 29 great-grandchildren. In those days when opium-smoking was a Government controlled business grandma’s father, Mak Chor Kun better known as Mak Puan, had a license to operate an opium business. 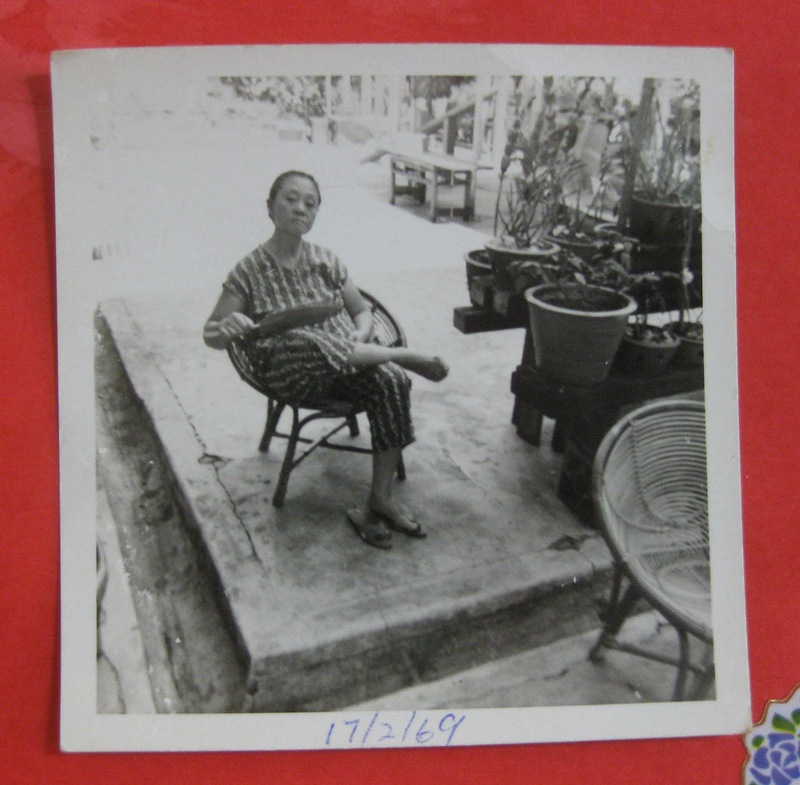 Mak however, was not only in the business but also indulged in the habit. This seriously drained the family’s resources and one rainy day, he was found dead on the street, probably from a drug-induced accident. 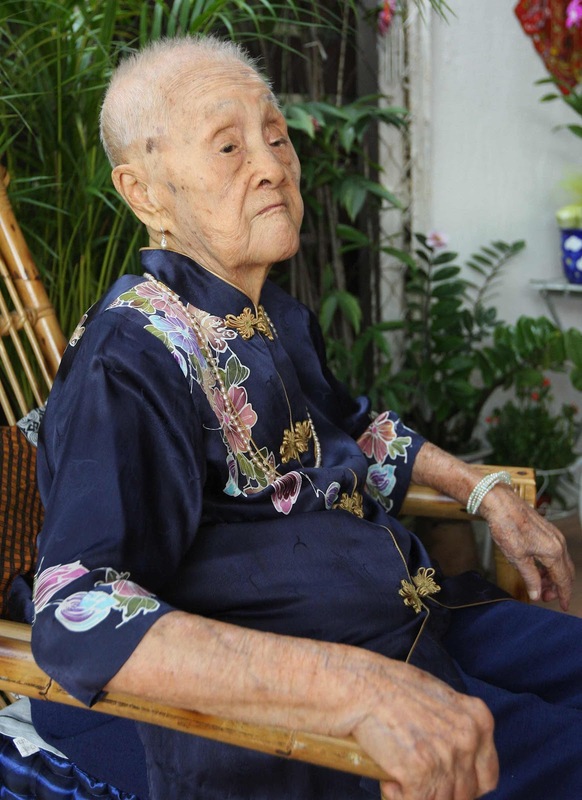 His widow, Fong Ah Leen, had to use her skills in sewing beautiful embroidery or sulam to earn an income. 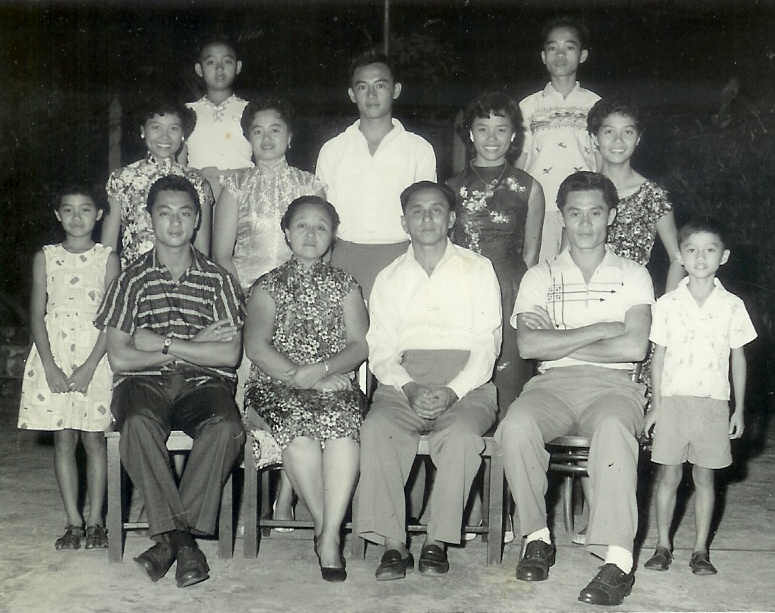 Grandma’s uncles, who were in the shipbuilding industry in Singapore, looked upon her with favour and they encouraged her personal development. At that time, girls rarely had a formal education but grandma went to school, learnt to play the piano by ear and also played badminton. This was probably how she met her husband, Ng Ngoh Tee, a Government servant who was also a badminton enthusiast. 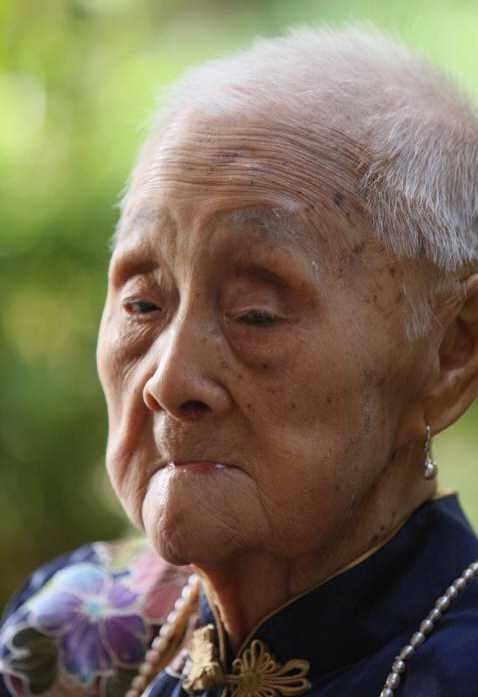 It was common then to marry young so she was married at about age 18. 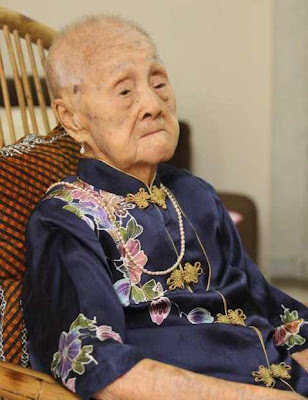 Instead of wearing the traditional kwa or qipao, she chose a modern Western-style wedding gown and had several wedding banquets graced by dignitaries, held in a week-long celebration. 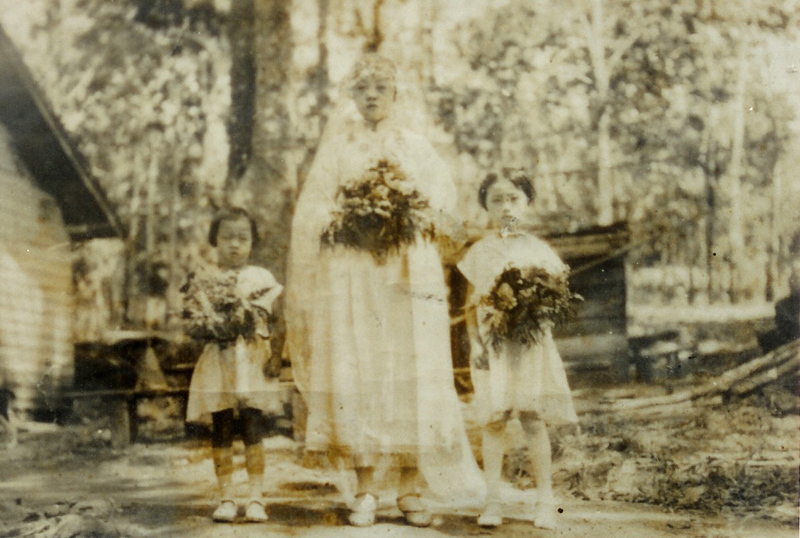 Marrying into a Teochew family presented grandma with many challenges because she was brought up in the Cantonese tradition and had a formidable mother-in-law whose hot temper earned her the moniker of Nyonya Kuching! 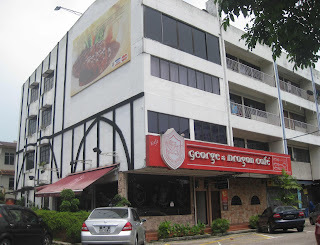 Grandma and Ah Kong first lived at Jalan Tangga Duke, an old road near Jalan Ibrahim in Johor Baru and later shifted into Government quarters at Bukit Chagar. Grandma had eleven children by normal birth, with a son born during World War Two so she had the added stress of nursing her infant, making sure his cries did not attract unwelcome attention. It was a serious life-and-death situation as they hid in the jungle because if they were discovered by marauding soldiers, every life was at risk! 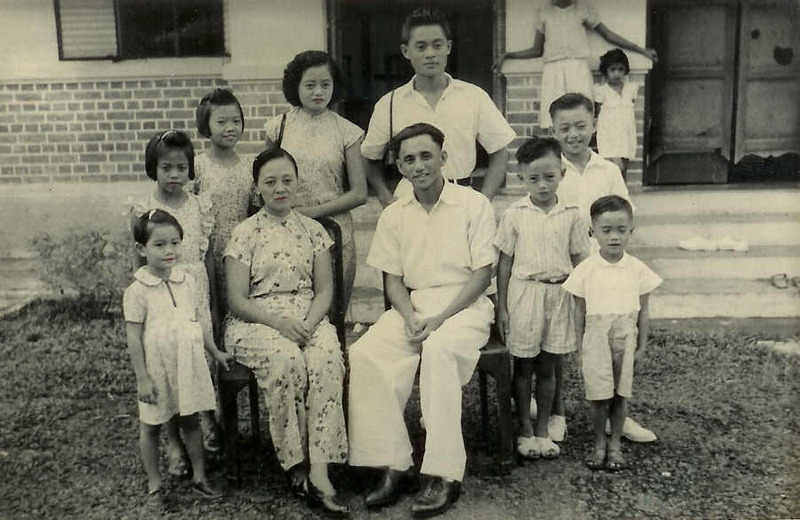 After the war Ah Kong, who was attached to the Malaysian Public Works Department and later the Johor Baru Land Office, was transferred to Muar. The family grew their own vegetables to eat and for grandma to make kueh for sale to supplement their income. With a head for economics, grandma also became a part-time property broker to earn extra income for the family. On Ah Kong’s transfer back to Johor Baru, the family lived at the Jalan Kolam Ayer Government quarters and later moved back to the family home at No.154 Jalan Ngee Heng. In our school-going years, my siblings, cousins and I lived with them in this bungalow with an adjacent badminton court and I had my share of duties when grandma assigned us tasks to help keep the home spick and span. 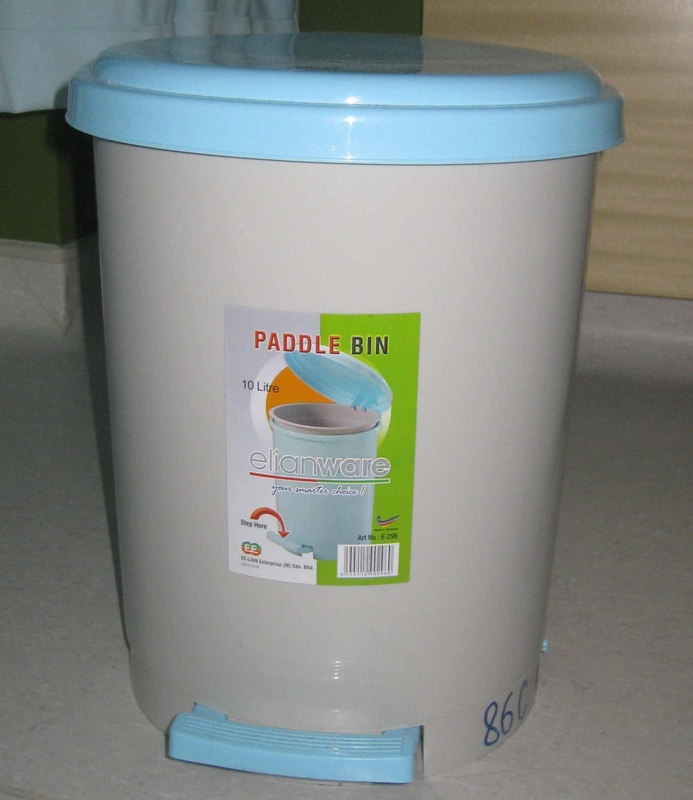 In those days when washing machines were still uncommon, she would hand-wash huge basins of clothes daily as the family was big in sports and played badminton daily. I always pictured grandma holding a ladle, dishing out food from a large wok, so I was pleasantly surprised when I saw old photos of grandma holding a badminton racket. Seeing her wielding a racket instead of a ladle gave me a fresh view of grandma. When I realized that grandma was among the pioneers of Malaysian sportswomen, I was filled with a new pride because in those days, most women were only busy with housekeeping and bringing up families. Badminton was grandma and Ah Kong’s passion and they earned a reputation as mixed-doubles champions. Their common love for the game also influenced the sports careers of their children – six boys and five girls. Nurtured by a supportive environment their children also excelled in other sports like boxing, rugby, football, basketball and athletics. Badminton is probably in the blood because a champion was born almost every 10 years – Roland Ng (1931), Billy Ng (1940) and Sylvia Ng (1949). Ah Kong was coach of the late, great Wong Peng Soon, helping him to master the most difficult stroke in the game – the backhand. Wong, grandma’s cousin, became the first Asian to win the All-England title in 1950 and went on to subsequent victories in 1951, 1952 and 1955. Ah Kong’s skills in badminton was passed down to the next generation as the Ng siblings trained together as sparring partners, refining their magnificent artistry in wristwork, cultivating clever court craft and developing a winner’s mentality in this great badminton family in the South. Meanwhile grandma would cook us nutritious meals, always with soup in the Cantonese tradition, and bolster our health with evil-smelling herbal brews. 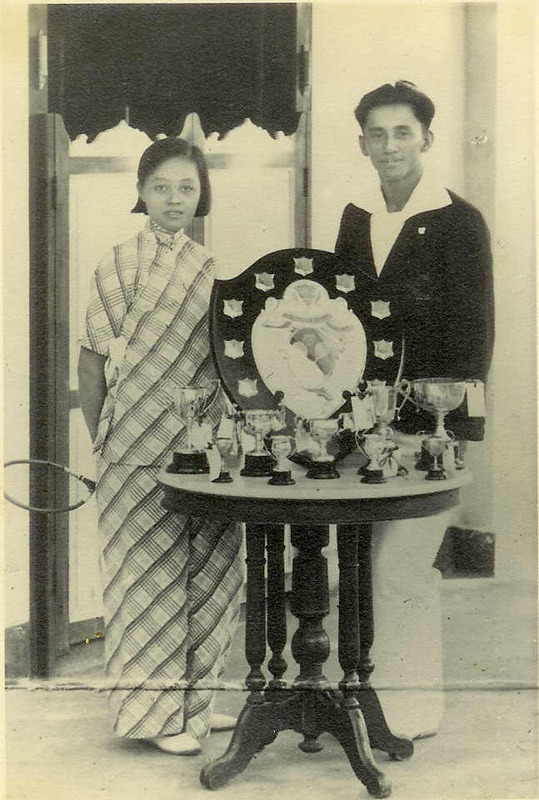 With her own experience in competitive badminton, grandma knew all about the right attitude and what went into the making of champions as her children kept the Jalur Gemilang flying! Back then every meal in Ah Kong’s house seemed like a big party because there were least 15 people dining together daily. Grandma would prepare food without the help of electrical appliances like blenders or food processors but chopped, sliced and pounded to cook for us over kerosene and charcoal stoves! 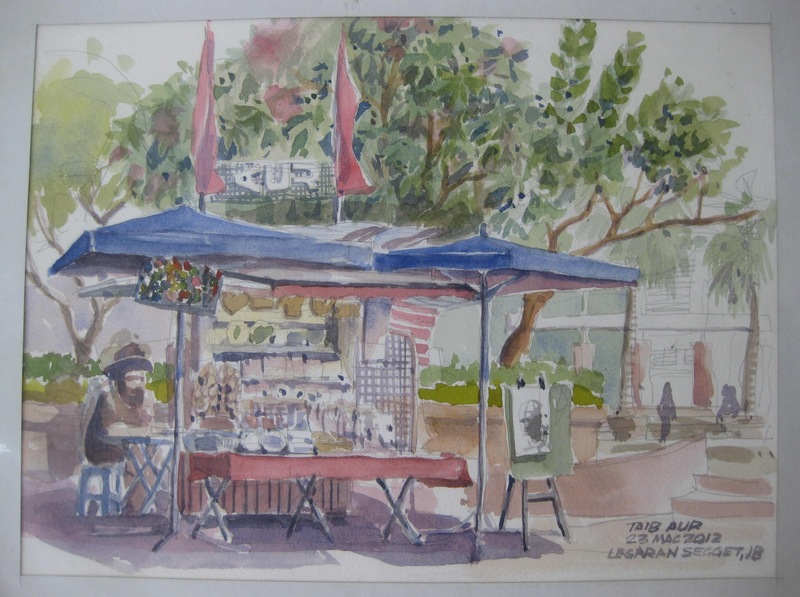 My cousins, Malcolm and Philip, dreaded market days especially when grandma bought bean sprouts because they invariably spent hours plucking the tails off kilos of sprouts, to the point where they sometimes nodded off to sleep! Ruby, my sister, recalls the kilos of fresh prawns with a shudder and to this day, does not eat prawns not because of any allergy but due to an aversion arising from her endless task of shelling prawns! Grandma has aged gracefully, free from diabetes, hypertension or heart problems and is still able to walk on good days. 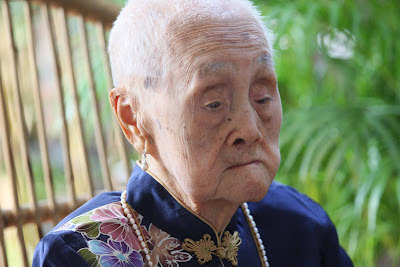 Her secret for this radiance, I guess, must be TLC [Tender Loving Care], a consistently healthy diet and the use of Sam Fong Hoi Tong pressed powder which she used as her daily make-up! As we celebrate grandma’s life and longevity, her frail mind may not fully appreciate its significance but we cherish her and keep her comfortable in the twilight of her life. We value how she has impacted our lives and just care for grandma who once cared for us. The roles are now reversed. Among other sports achievements, Roland Ng was Johor champion from 1963 to 1973, National Veterans singles champion in 1971 and double gold medalist in the first World Invitation Badminton Veterans Tournament in 1983. Billy Ng was Malaysian Open men’s singles champion in 1964 and a member of the 1967 victorious Thomas Cup team. Sylvia Ng achieved State and National titles as well as medals in the South East Asia Games and Asian Games and on 12 August 1978, she made history by becoming the first Asian woman to win the Commonwealth Games singles Gold in Edmonton, Canada. 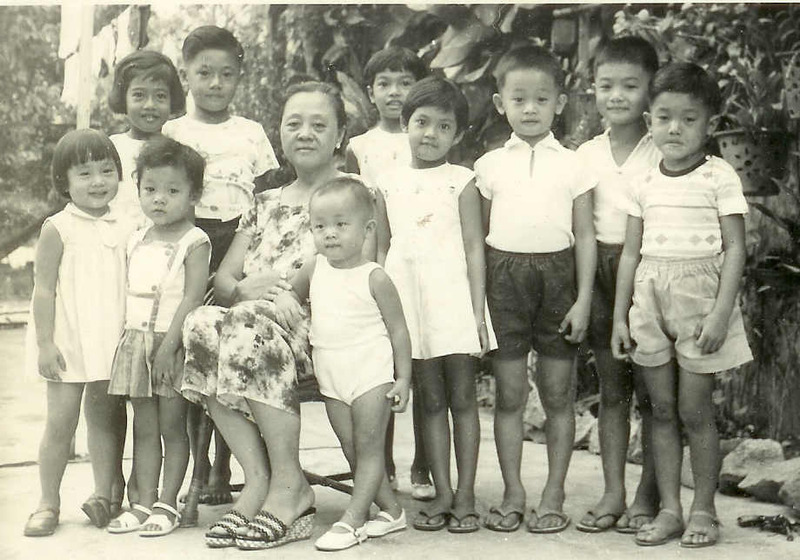 Auntie Sylvia, 6-time National champion was honoured Sportswoman of the Year in 1975 and 1978. Auntie Sylvia and Uncle Billy were inducted into the Olympics Council of Malaysia Hall of Fame in 2004 and 2008, respectively. In July 2010, Uncle Billy was conferred the Darjah Indera Mahkota Pahang (DIMP) which carries the title, Dato’. Her lips are a healthy red even without wearing lipstick! 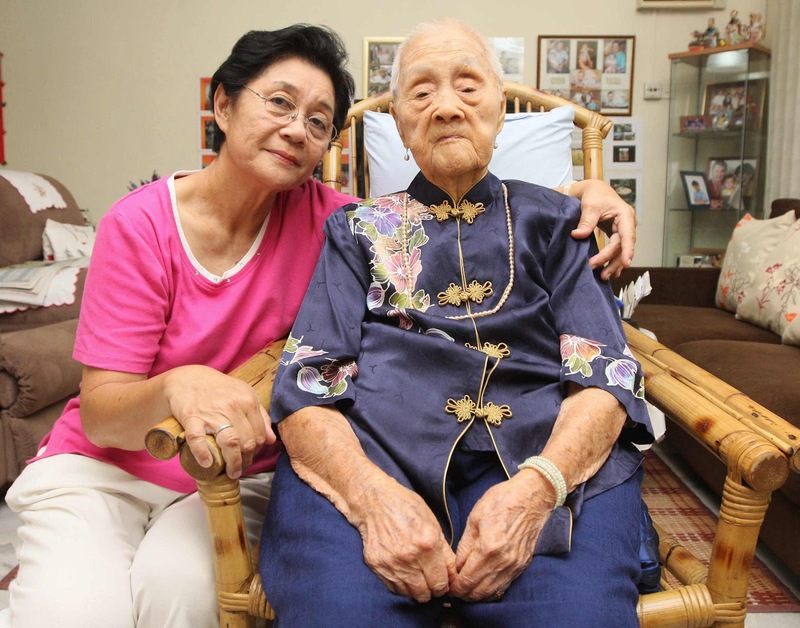 Peggy Loh is the youngest daughter of grandma’s eldest daughter, Lucy Ng. 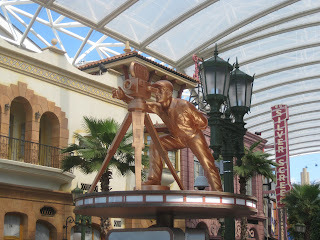 Planning a trip to Universal Studios in Resorts World Sentosa, Singapore? This is truly a destination for family fun so be sure to plan your day to explore the park’s seven zones in Hollywood, New York, Sci-Fi City, Ancient Egypt, Lost World, Far Far Way and Madagascar. Here are ten things to help you make the most of your trip. Gear yourselves up for a day of fun-filled activities by wearing suitable footwear for lots of walking and exploring in the park. Pack a change of clothes if you don’t want to drip-dry after some adrenaline-pumping rides that may come with a wet and wild end! Study the Studio Guide with map to chart your course and check show-times for shows, rides and street entertainment so that you can catch as many as possible. Then you won’t waste time and energy walking the distance and double-backing on your route around the park and risk missing any excitement, especially if you are into rock music that’s featured in the Monster Rock show at Pantages. 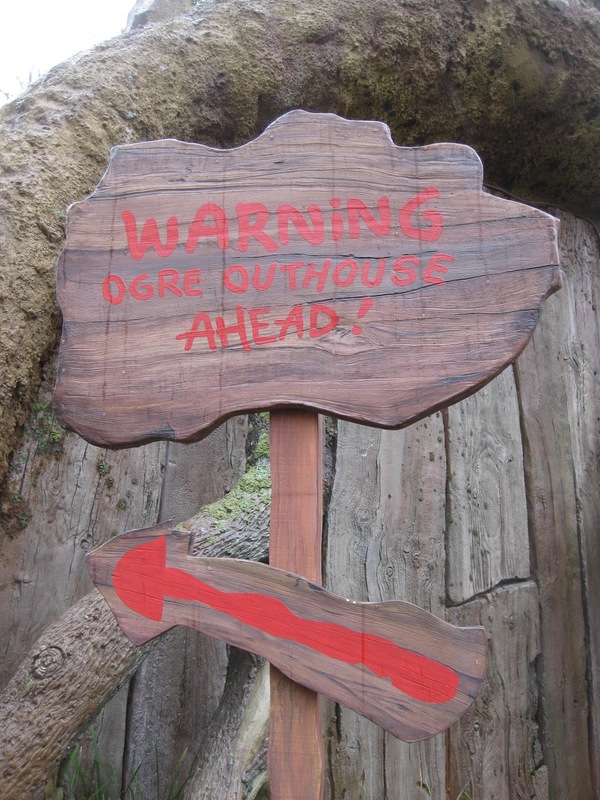 Even ogres need to use the outhouse (toilet) so let the child in you discover this ogre-size wooden structure that’s built on a little hillock. Follow the signs to it and try tapping on its imposing door to see what happens! Get into this movie set inside a boathouse to have first-hand experience of a Category 5 hurricane about to hit New York City. Brace yourselves to see how calm suddenly turns stormy and face hurricane-force wind, falling debris and shattering glass for a magical movie experience. Hang on to your seats and get ready to see, hear and feel the exciting adventure with Shrek the ogre, Princess Fiona, the talking donkey and other lovable characters in the Shrek series. For the fourth dimension effect, just put on those ogre-vision glasses! Check out the many dining options designed in the theme of each zone to enjoy casual or fine dining, exotic to local fare and fast foods. 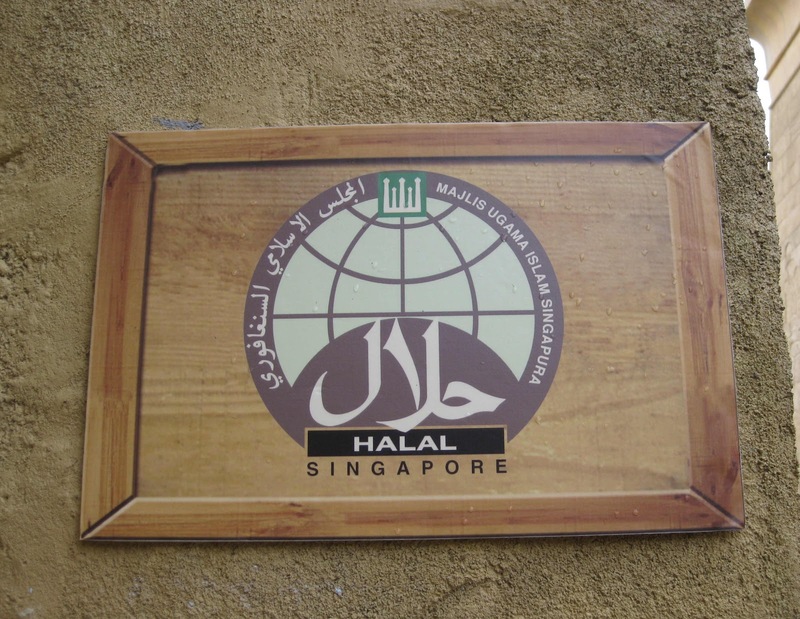 The Oasis Spice Café in Ancient Egypt serves the best of Mediterranean, Indian and Malay cuisine so just look for the sign that clearly indicates that they are halal restaurants. The park is dotted with interesting and irresistible snack stops so don’t worry if you have a snack attack. 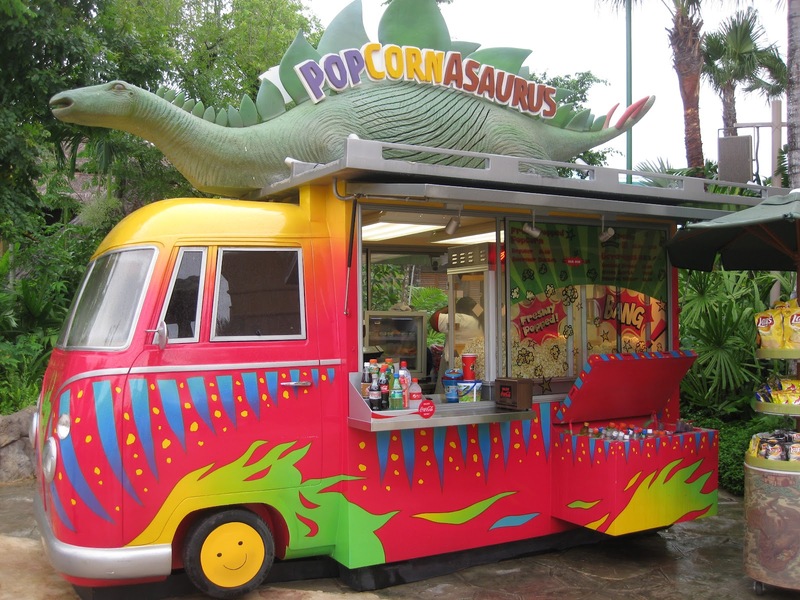 In Lost World, there are Fossil Fuels, a fast-food restaurant that promises fresh and delicious meals and Popcornasaurus that sells – you guessed it – pop corn! 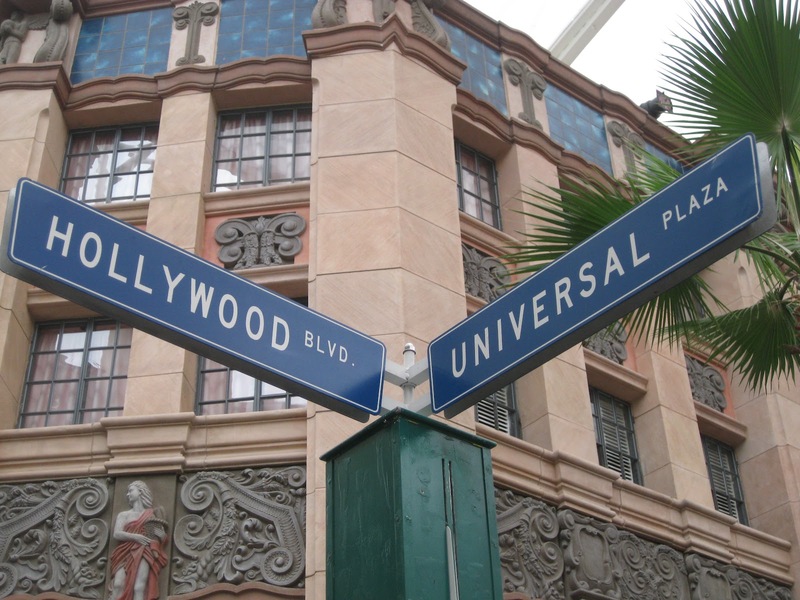 Don’t be surprised if you bump into colourful characters like Herman Munster, Woody Woodpecker, Kung Fu Panda, Charlie Chaplin and Marilyn Monroe, strolling along the Walk of Fame or Hollywood Boulevard. Never mind the crowd because your patience will pay off when you finally get to meet the stars and have your photo taken with them! 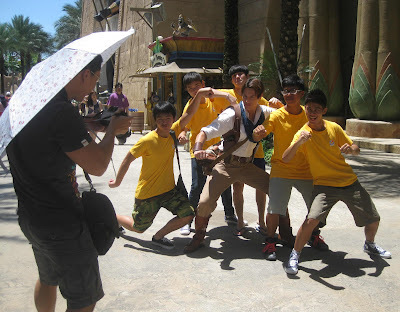 Here are a few boys posing with Rick O'Connell, Brendan Fraser's character in the Mummy movie series. Soak in the atmosphere of a bygone era to a backdrop of Hollywood fanfare music and linger on the streets lined with shops reminiscent of the 1940’s. 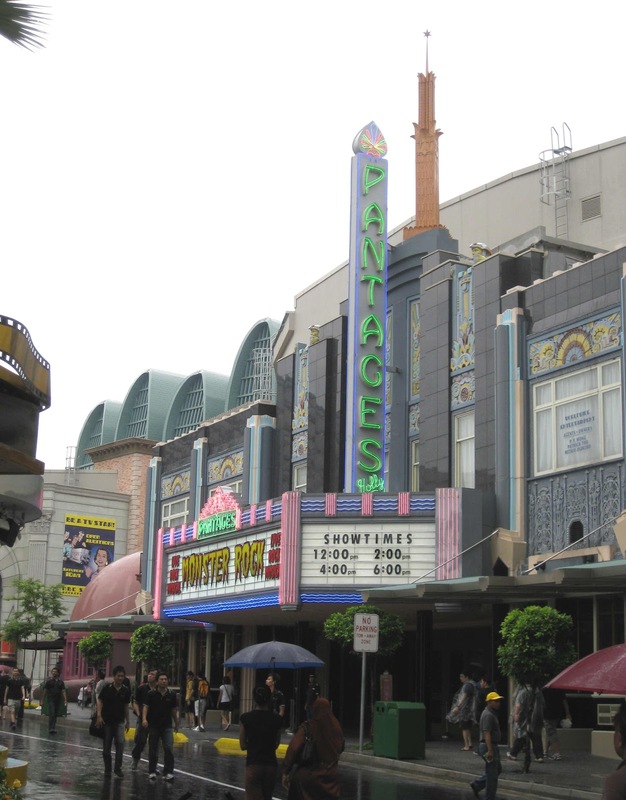 Snacks and souvenir stores stocked with attractive collectibles are situated at every street corner so don’t be surprised that you are sorely tempted to buy everything you see! This high-speed rollercoaster is not for the fainthearted because it is non-stop excitement as you plunge into darkness and are plagued by an army of horrible mummies, swarms of insects and huge fireballs. 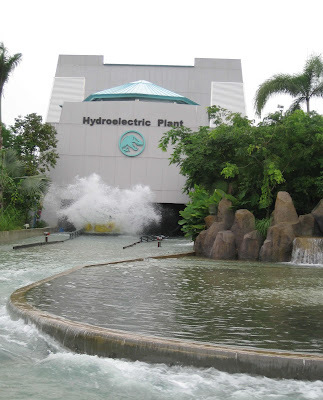 But if you get a kick out of such shocks, this is a ride not to be missed! Ten years ago, when Patricia Chew saw that piece of property in Taman Tasek, she and her husband decided that it was an ideal spot to start a little café. A great deal of thought and planning went into preparing the premises, and it included shipping in genuine English artifacts from her home country, England. 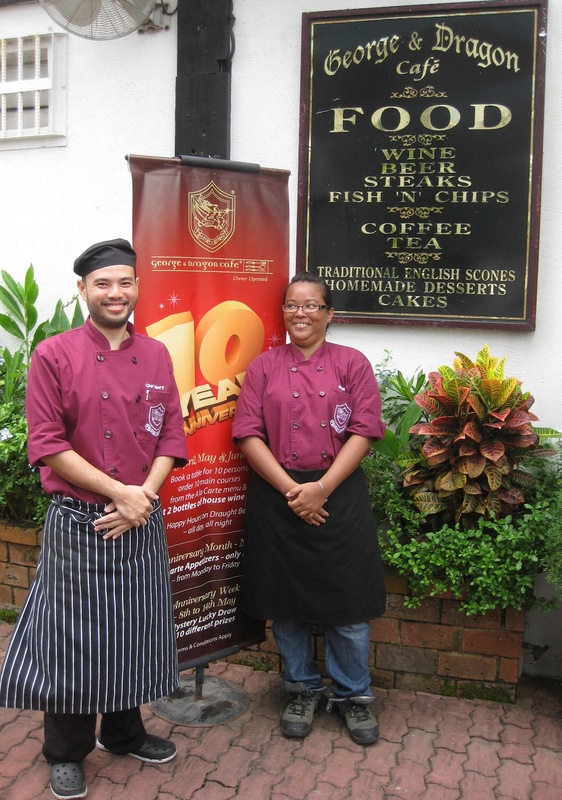 On 10 May 2002, George & Dragon Café opened for business and this May marks ten years of serving their menu of traditional English and Irish tavern food in charming old-world ambience. Dining in George & Dragon is like taking a trip into medieval England because the décor features suits of armour standing in silent sentinel while maps, shields, coat-of-arms and flaming torches adorn the walls. As you appreciate the English artifacts, try to spot a collection of cutlery in a glass covered display box that used to belong to Chew’s grandfather. You may even get a kick out of sitting at custom-made wooden tables that are supported by antique cast-iron sewing machine legs! 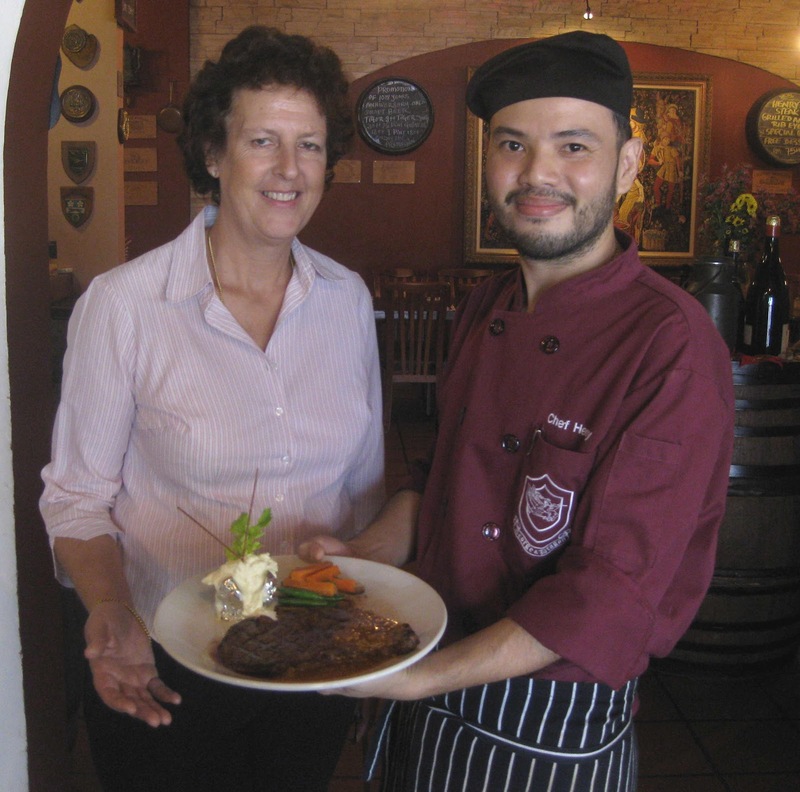 On the cover of the menu, diners are invited to “Taste the Best Steak in Town” and other specialties that are skillfully prepared by Chef Henry Tan. Chef Henry, 38, who hails from Batu Pahat, has helmed the kitchen for the last 10 years and the signature Grilled Angus Rib-Eye Steak is better known as Henry’s Steak because it is now synonymous with him. Working with him, is Sharianah Panachok, 33, or Ana in short, from Pontian who has also been with the café for the past 10 years. signature grilled Angus Rib-Eye Steak a k a Henry's Steak! “We concentrate on creating the sauces,” said Chef Henry who explained that good cuts of meat are the same everywhere but his special touch and unique sauces distinguishes their steaks from others. Marinated in spices and grilled to your liking, the Angus Rib-Eye Steak may cost a little more but it is worth every juicy bite. 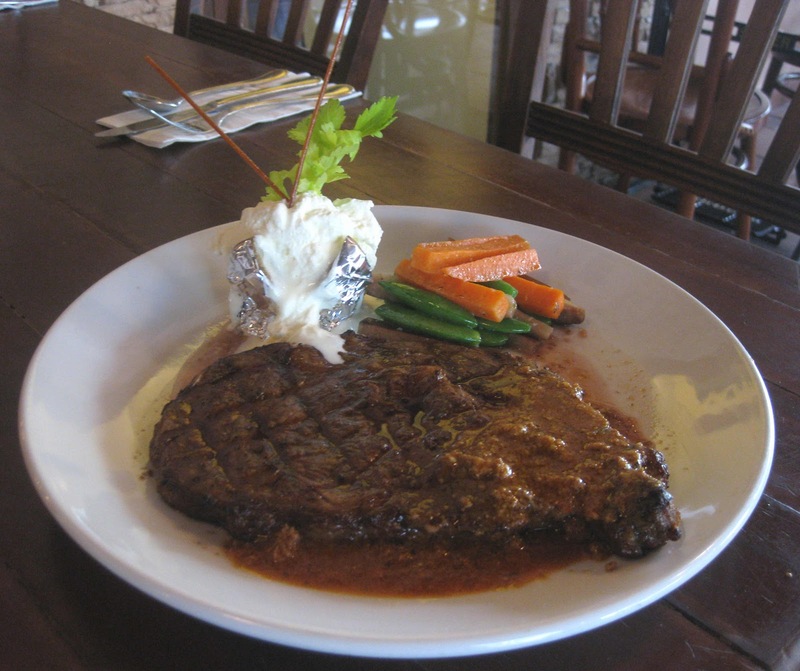 Topped with their signature minced beef sauce, you will have the double pleasure of tasting the delicious texture of both the juicy steak as well as the meaty globules in the sauce. “Asians often ask for more sauce while the Americans prefer the original steak flavour without too much sauce,” said Chew from her observations through the years of serving guests. To ensure that no MSG is used in their recipes, Chef Henry prepares all their sauces from fresh ingredients. Besides the meat sauce topping, there is a choice of Black Pepper, Mushroom or spicy Barbecue sauce to go with your beef steak while the Salmon Steak can be savoured with Garlic, Lemon Butter or Creamy Black Pepper sauce. 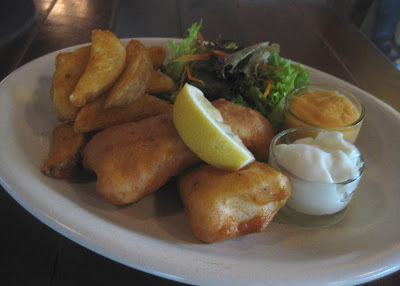 George & Dragon has a reputation as the epitome of Englishness in Johor Baru so this is where you can taste traditional English Fish ‘n Chips prepared with generous chunks of Pollack coated in a light tasty batter. If poultry is your pleasure, then try Sherwood Chicken, char-grilled marinated chicken topped with piquant sweet and sour sauce. Its very name simply conjures visions of Robin Hood riding through Sherwood Forest with the notorious Sheriff of Nottingham in hot pursuit! 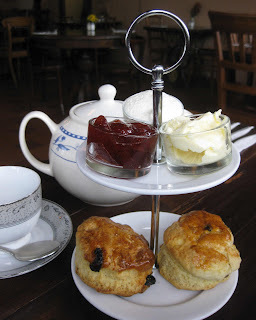 Afternoon High Tea can be enjoyed from 3pm to 6pm daily in a set that comprises freshly baked scones served with clotted cream, jam and butter, a choice of cake and delicate tuna, smoked salmon and cream & cucumber sandwiches. The set comes with your choice of English tea or freshly brewed fragrant coffee. There are also homemade English desserts like Apple Pie, English Trifle, Chocolate Fudge, Blueberry Cheesecake and Chocolate Mousse to satisfy diners with prefer to end their meal sweetly. 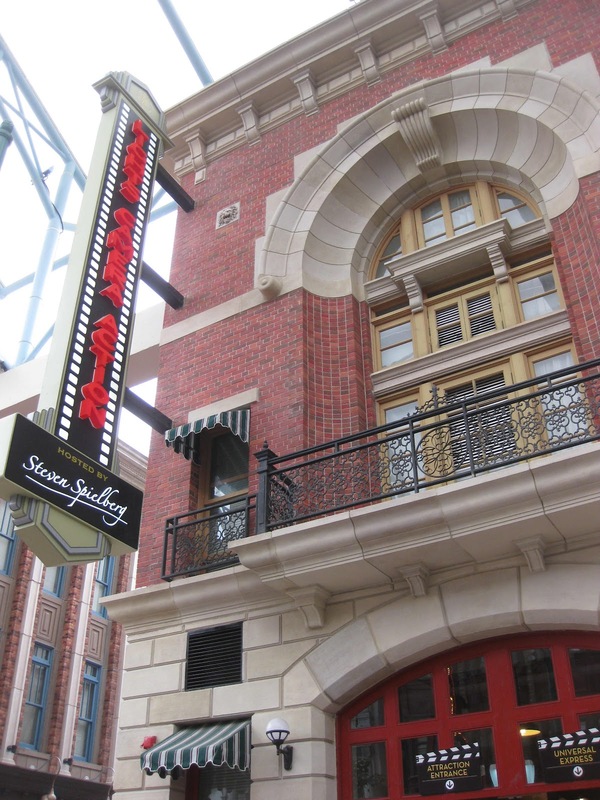 To celebrate their 10-year anniversary, diners enjoy special promotions where every party of ten people will receive two free bottles of wine in May through June. In the anniversary month of May, weekday diners can enjoy ala carte appetizers at only RM10 each and on the anniversary week (8 to 14 May 2012) diners stand to win mystery prizes in a lucky draw. A special 3-course dinner menu is also designed for Mother’s Day parties. George & Dragon was recognized as a Best Restaurant by the Singapore Tatler in 2003 and 2004, and the café also became renowned for their range of luxurious Christmas food and wine hampers. 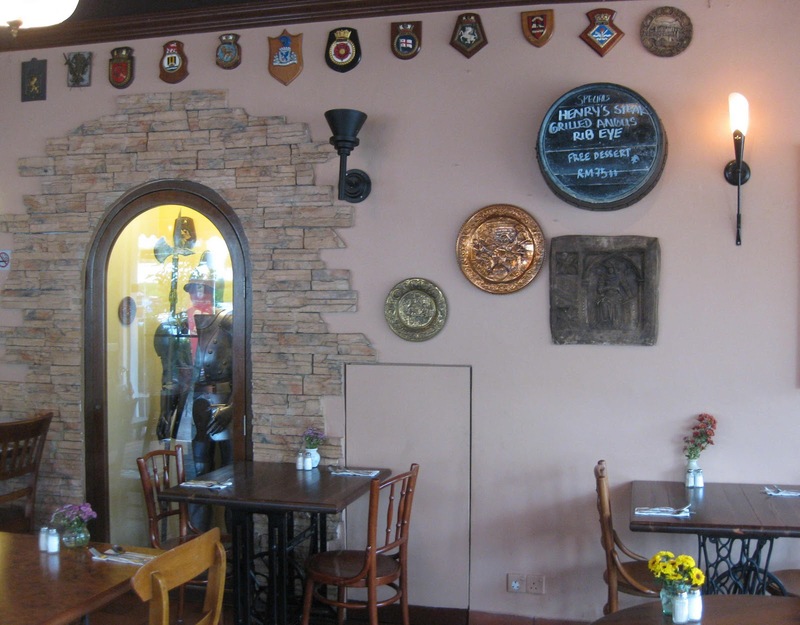 In 2008, they received the Silver National Quality Toilet Award in the Restaurant & Café Category from the Ministry of Housing & Local Government for their comfortable restrooms and a similar local award again in 2010. To increase seating room, the café in Taman Tasek expanded into a double shop-lot in October 2003 and a second outlet was opened in the Johor Premium Outlets in December 2011.